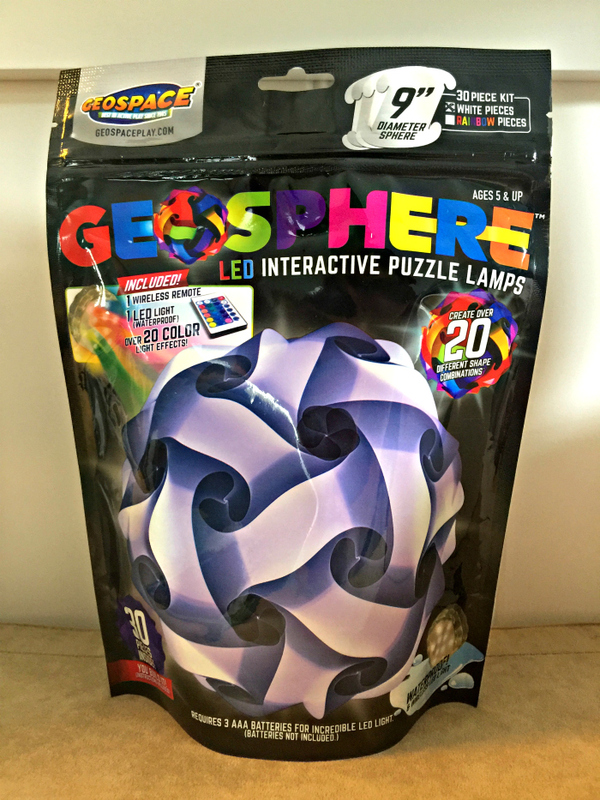 My son is a huge puzzle fan which is why we were so excited to try out the Geosphere puzzle lamp kit in white. Not only is this kit a fun puzzle, it’s also a very practical idea since it can be used as a lamp in a bedroom or playroom after being built. The lamp was a harder puzzle than my son is used to, so we decided to do it together as a mother/son bonding experience. To make it more fun, we looked up a YouTube video that had instructions on building the lamp so that my son could follow along better with my help. He loved laying out the plastic pieces in the rows needed to build the Geosphere. We then worked together to link the pieces. Once the Geosphere was complete, my son couldn’t wait to put it in his room and try it out. 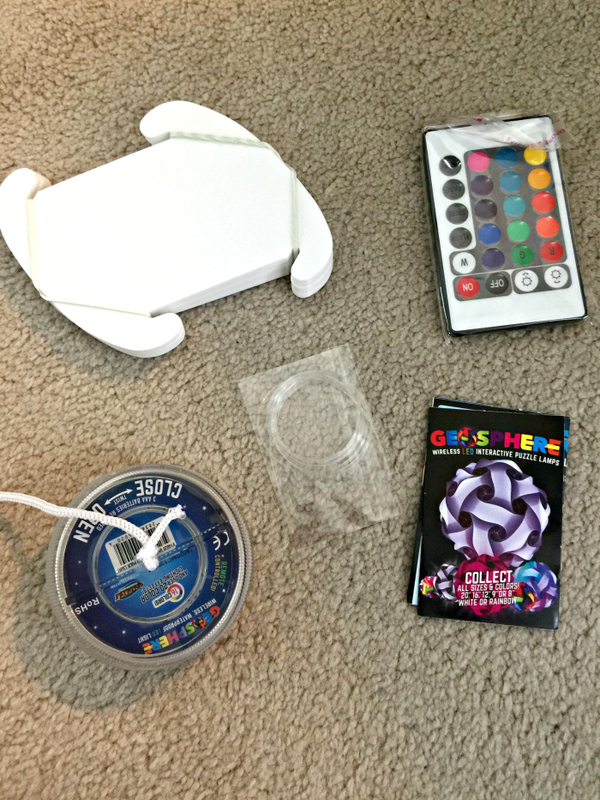 He loved all of the different things he could do with the remote, from displaying his favorite color to creating a strobe light that flashed all of the colors. 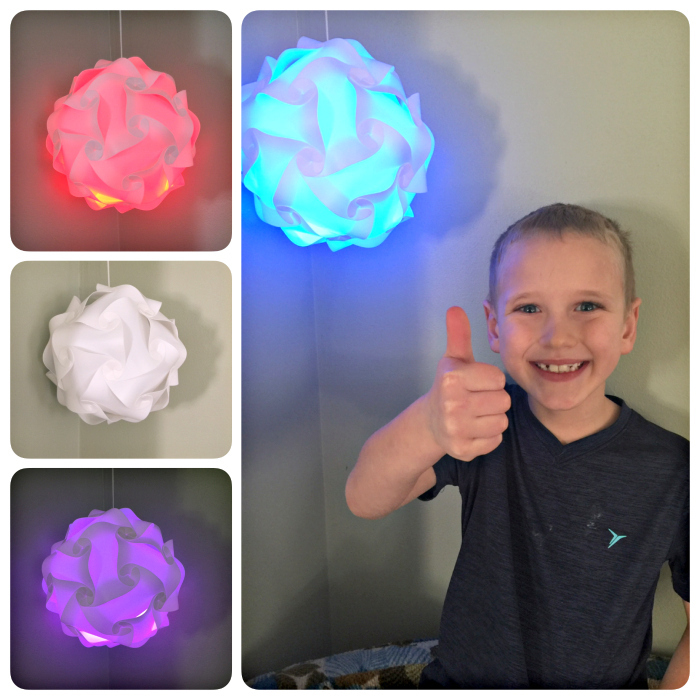 He loved showing of his Geosphere to any friends that visited, all of whom were very impressed with this lamp. Overall, the Geosphere was a fun activity for my son and I to do together. We loved building the puzzle just as much as we loved the finished product. I would recommend this for any parent and child to do together. However, if your child is planning to do this puzzle alone, I would recommend your child be a little older. It was a little too difficult for my 7-year-old to do by himself, even with the YouTube video. Are you interested in getting a Geosphere for your kids? You can click here to find an 8-inch Geosphere in white and rainbow colors! Have fun building this lamp kit.